1. Skin-to-Skin Contact. Babies thrive on touch. Skin-to-skin contact involves holding the bare baby to your bare chest. It's especially important right after birth, but is a great way to continue bonding as baby grows. Skin-to-skin contact has numerous benefits for baby including regulating baby's body temperature, heart beat and breathing, boosts mental development, reduces stress and crying, aids in milk production and more. 2. Eye Contact. Newborns love looking at faces. They can see best about 12 inches away from their face, which is just about the distance you'll be looking at them from when you hold them in your arms. As you gaze into your baby's eyes, you can talk and sing to them. 3. Breastfeed. Breastfeeding is a great opportunity to incorporate skin-to-skin and eye contact as well. Allow baby to nurse whenever they want to, for hunger or comfort and take the opportunity to relax with baby. 4. Babywear. Babywearing is a great bonding experience and can be done by any caregiver. It keeps the baby close and gives the caregiver an opportunity to get better acquainted with baby's cues. It is often very relaxing for babies as it simulates being in the womb and can help get them to sleep. There are many different types of baby carriers and benefits to babywearing. 5. Massage. 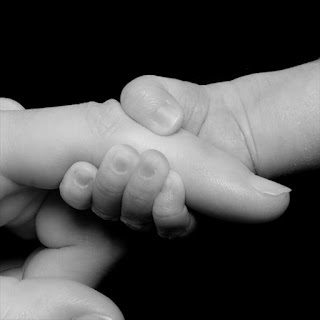 Infant massage is another great way to incorporate baby's need for touch into the bonding experience. Gentle strokes aid in baby's emotional development, improves sensory awareness and stimulates digestion. It can be a great routine before baby's bed time to help them relax.